Lakeland Bank's EVP of Financial Service, Jeffery J. Buonforte talks about financial planning and your future. With interest rates at historic lows, many Americans are choosing to refinance in order to reduce their monthly payment. Refinancing may be ideal for many homeowners, and it's a good time to determine if refinancing is the best option for you. Colleges and universities are particularly vulnerable to cyber attacks. Lakeland Bank offers four tips to protect your personal information at college. Lakeland Bank's Bob Vandenbergh talks about asset based lending and provides some tips for those that are in the market for ABLs. 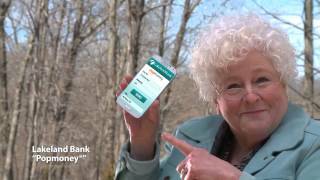 Lakeland Bank offers five ways to protect yourself, or your loved ones, from financial scams targeting seniors. Social networks and smartphones loaded with mobile applications that are changing the way we bank, do business, and communicate with friends and family but are they also leaving you vulnerable to financial fraud and identity theft? Here are 7 tips on how to protect yourself. Learn how to protect yourself from identity theft with these tips. Learn more about your Business Credit score and how your personal credit and finance history are important when looking for business financing. With mortgages at historically low rates, many Americans are taking advantage of the opportunity to refinance as a way to reduce their monthly payments. If you are considering refinancing, it's important to research your lending options. Here's a simple research checklist. Data breach headlines remind people that millions of Americans have their identities stolen each year. It can be expensive and take many days to fix the damage caused by an identity thief. To protect your identity: create strong passwords, guard your social security number carefully, monitor your bank account and credit card statements regularly, be careful with your mail, and get a free copy of your credit report annually from Equifax, Experian, or Trans-Union. Watch our video for more tips to help minimize the risk of identity theft. Cyber criminals are targeting the financial accounts of small businesses resulting in significant losses due to fraudulent transfers from business accounts. This type of crime, referred to as Corporate Account Takeover, involves thieves gaining access to your business' confidential banking information to make unauthorized transactions, including transferring funds from the company, creating and adding new fake employees to payroll, and stealing sensitive customer information that may not be recoverable. Popmoney®, "Pay Other People" (POP), allows you to send, request and receive money to or from individuals using their email address, mobile phone number or bank account information. 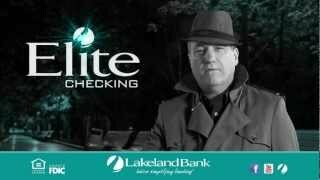 Lakeland Bank's new commercial on Simplifying Banking! Planning for retirement is a goal that most people agree is important. But less than half of Americans have calculated how much they need to save in order to retire. Lakeland Bank offers a simple checklist of items to consider when planning for retirement. 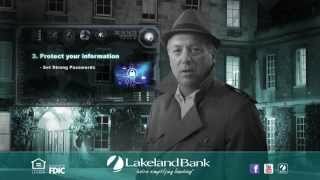 Lakeland Bank six tips on how to minimize your risk of identity theft on social media! Affordable prices and favorable interest rates have created ideal circumstances for buyers in New Jersey. Lakeland Bank's latest video from COO, Robert A, Vandenbergh, talks about the various financing options available to help you take advantage of the current market. Lakeland Bank COO, Bob Vandenbergh discusses financial planning tips for preparing to pay for college expenses. Lakeland Bank's Executive VP, Jeff Buonforte, provides tips on how to save for college. Lakeland Bank's EVP & Chief Lending Officer, David Yanagisawa talks about understanding the importance and makeup of your business credit.